The design goal of this feature is to create a backup of the backed up data to a public cloud. Backing up data to public cloud involves additional cost, which is typically based on two factors: amount of data stored and its access frequency. Keeping these in mind, the following features are added. One profile running on Client B contains important data to justify the cost incurred by cloud storage. 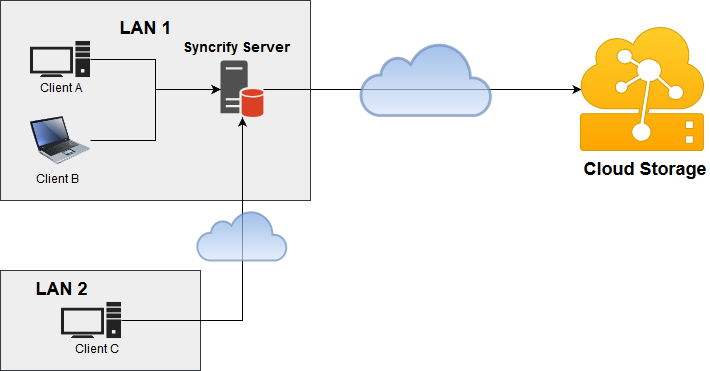 End-user, who is the owner of Client B, can either view files using Syncrify Server's web interface or directly connect to Amazon S3 Bucket to access files. Note: If encryption is used in Syncrify, files residing on Amazon will also be encrypted and must be manually decrypted. Use the following steps to configure a cloud service. There is no limit on the number of services used. Click Configuration and select Cloud Services by clicking the button for More Configuration Options on upper right hand corner. Next, you will need to associate one or more profiles to the newly created services in step 1. Following steps demonstrate how to accomplish this task. Following page will display profiles belonging to this user. The last column, Action, contains an icon for cloud. See image below. A grey icon suggests no cloud snapshot is configured where as a red icon means snapshots are configured for this profile. Select the desired Service Name. The names you see in this list come from the services you configured in Step 1 above. Select a frequency for the snapshot. numbers higher than 1 signify the nth value. For example, if you specify 10, a snapshot will be taken after 10th backup. Do not check the box for Backup Versions unless you use 1 for frequency. Click here for an explanation. rsync protocol is NOT used when transferring data to the cloud. That is because no process runs on the other end that can compute block signatures and merge incoming delta from the source. Therefore, entire files will be copied to the cloud if it gets modified. A new report has been added to Syncrify showing a history of snapshots created on the cloud. Click Reports on the left panel to access this report.